The actual railway line in Thailand (and Burma) that Japan infamously had built by forced labourers, including western POWs, during WWII. 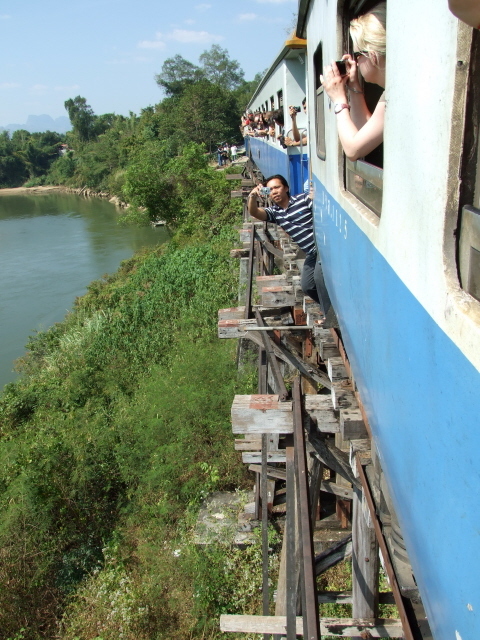 The stretch from Bangkok to Nam Tok is still in use today and you can ride regular passenger trains all the way, with the Bridge over the River Kwai and especially Wang Pho viaduct forming the highlights. More background info: the construction of the Death Railway by forced labour is one of the best-known atrocities of WWII in the Far East. Imperial Japan had occupied much of a huge area between the Pacific and India, including Singapore and what today is Indonesia. Here, thousands of western POWs fell into their hands. Japan had not signed up to the Geneva convention which, amongst many other provisions, prohibited using POWs in war-related construction projects. So they made use of those captured Dutch, Australian, British and American POWs. 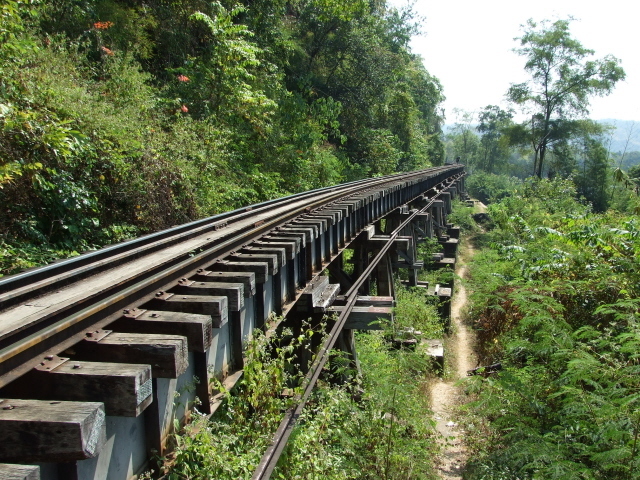 One of the most ambitious construction projects was a new railway, cut through the jungle, to connect existing railway lines in allied Thailand with ones in occupied Burma (today's Myanmar), a supply route for expansions further west (into India). So from summer 1942 work began on the railway, under increasingly inhumane conditions. Not only was the treatment of the POWs brutal, rations were so low as to be close to starvation rations. Work was hard, sanitation minimal to say the least (esp. in the muddy rainy season). On top of that came tropical diseases. The whole situation was a hell on earth, with ulcer infested prisoners starved to mere walking skeletons having to toil away for 13 or 14 hours a day. Images of the prisoners are immediately reminiscent of those of Nazi concentration camps. The death toll, unsurprisingly, was atrocious. Between an eighth and a quarter of the POWs did not survive. To be honest, given the circumstances, it's actually surprising that so many survived. Out of the western POWs, the British suffered the highest death rate (nearly 7000). But even that is nothing compared to the fate of the Asian, esp. Burmese, Malay and Tamil forced labourers, amongst whom the death toll was disproportionately higher. One estimate put the total figure at ca. 100,000, with 86% of the dead Asians. Still, the conditions for POWs working on the Death Railway were amongst the worst ever encountered by any POWs in modern history. Figures vary, of course, esp. with regard to the Asian casualties. There is also confusion in the figures one can find published about POWs, esp. 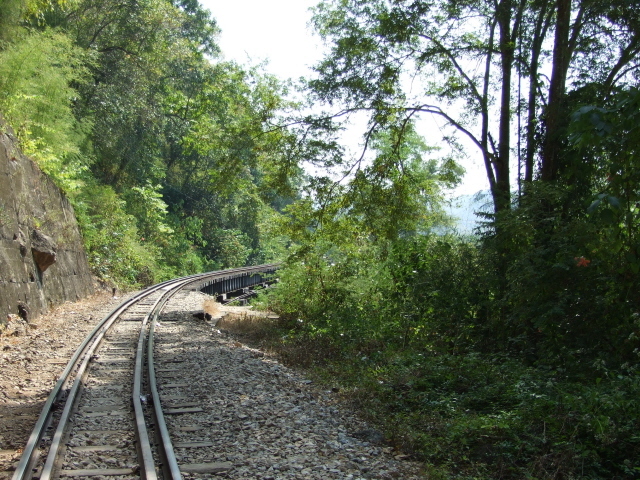 whether they are confined to this railway line construction alone or whether they also take in Japanese-held POWs in general, including other occupied territories like today's Indonesia – the worst figures about the death toll amongst Japan's POWs put it at something as high as 25%, as opposed to only 4% of Allied POWs in Germany. Conditions were worst during the so-called "speedo" phase in the summer of 1943, when the Japanese ordered construction speed to be increased and work continued through the night by torchlight. 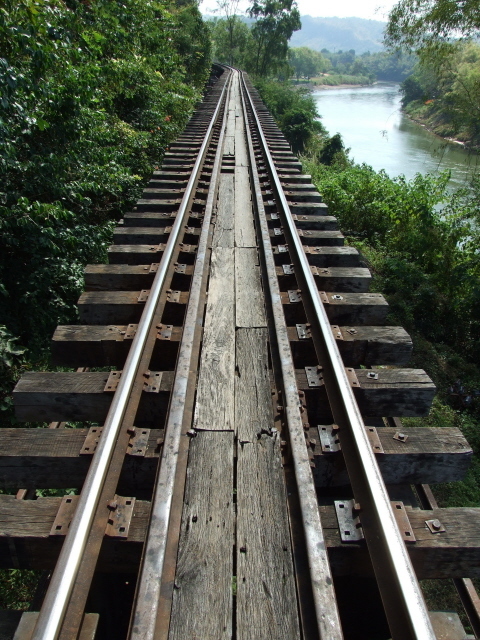 In the end, the over 250 mile (400 km) long train line was completed in just 16 months and quickly put into use to transport supplies into occupied Burma, avoiding the sea route, which had become too unsafe. This had been the main incentive for building the railway in the first place. Towards the end of WWII the railway increasingly came under attack from the air and was disrupted, but repairs were always quick. But as Japan was losing the war and Burma was reoccupied, it lost its purpose. After the war it remained in operation briefly (also for the recovery of buried POWs and for surveying the former labour camps) but was soon discontinued. The western part was later repaired and put back into regular service in Thailand. But the northern stretch into Burma was dismantled. Parts of the former course of the railway can be visited at Hellfire Pass, however. In the West, especially in the nations whose POWs had to suffer for it, the actual strategic usefulness of the railway is often played down, as is the achievement of the Japanese engineers. It was, however, a major feat, one that the British themselves had given up on when they initially surveyed the area for a planned railway decades before. The Japanese however made it happen, and with awesome engineering quality – it's just that they could not have done it without the manual labour of those thousands and thousands of mistreated prisoners and conscripted Asian labourers. It is thus both evidence of a major Japanese war crime and at the same time a great engineering achievement. The paradox is indeed striking. Particular admiration, however, has to go to those POWs who managed to hold out and survive in all the prolonged squalor, surrounded by death and disease. Hearing the testimonies and seeing the evidence of all the physical and psychological ingenuity amongst the prisoners during that time is extremely touching. It is this aspect that made the most lasting impression on me when I visited the various museums and sites of the Death Railway. Note that if you can't make it to the actual sites, there are sites outside Thailand that include information about this episode of WWII, notably a dedicated museum that is part of the National Memorial Arboretum in Great Britain. The Imperial War Museum in London also has a section on the topic. Note too, that the famous film "Bridge on the River Kwai" does not represent reality very well – neither the bridge itself (which in reality looks totally different) nor the heroism of the POWs and their military. 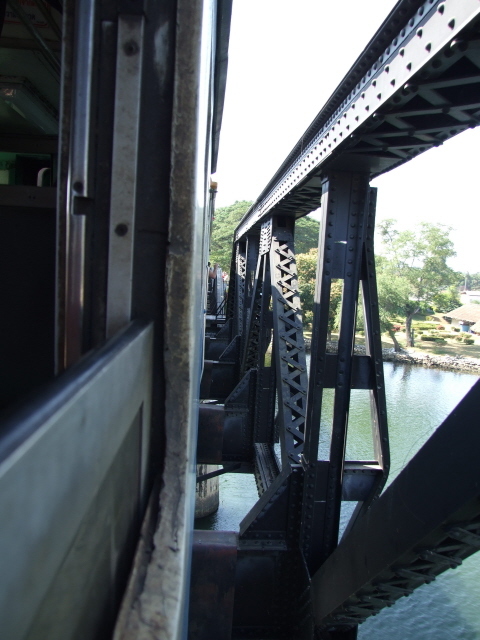 See Bridge over the River Kwai for more. What there is to see: for most of the line not much at all. The initial bit between Bangkok and Kanchanaburi is pretty unspectacular. 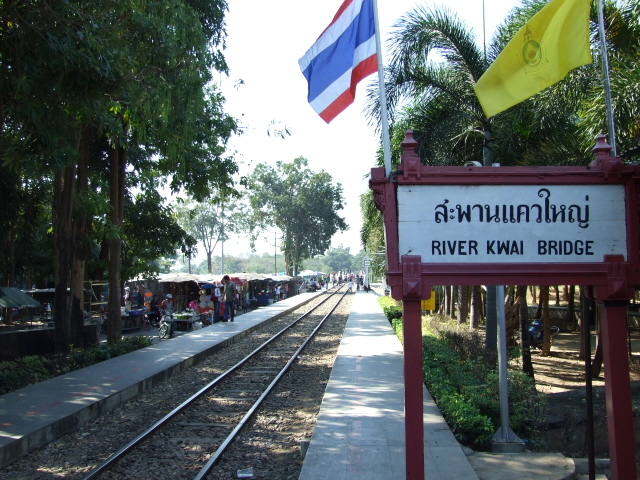 It really only gets interesting from Kanchanaburi, beginning with the famous Bridge over the River Kwai – which accordingly has its own entry here. Then there are more boring bits, but also some good views of the River Kwai, whose course the rail line roughly follows north. The best bit is Wang Pho viaduct. This is an original wooden trestle bridge that clings to the steep cliff-face high above the river. Make sure you are sitting by a window on the left side of the train (or on the right-hand side on the return journey) – otherwise you won't see much. I saw some really crazy people hang from the doors in order to get a good photo shot of the viaduct ... it looked just as suicidal as it sounds. I'd recommend sticking with a window. This stretch can get very crowded very suddenly, as package tour groups are loaded onto the train for just this short bit, getting on at the station before and being collected by coach at the next station. At least that's what happened when I did the ride in January 2009 – it looked pretty much like routine, though. I had it more peacefully, as I was doing the Death Railway as part of a more comprehensive arrangement (see below) involving a car with driver and guide. My guide also suggested something that I would not have thought to be an option, namely: to get off at the stop just beyond Wang Pho viaduct (the station is called Tham Kra Sae) and walk back along the viaduct! Obviously not all the way back to Kanchanaburi, but at least along part of the viaduct, which is comprised of several sections of a few hundred yards length in total. 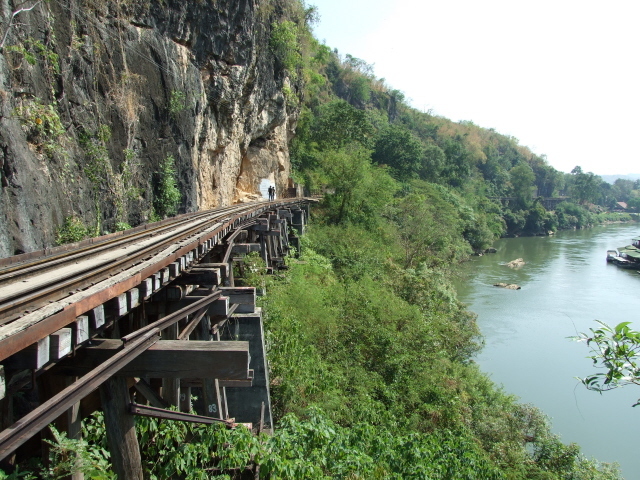 I already thought that at the Bridge over the River Kwai health and safety issues were not a big concern in Thailand, but now take this in: it is a single track and once on the viaduct there would be nowhere to get out of a train's path up here. OK, since the train you'll just have left won't be due to return for a while, and intervals in between trains are long, you don't have to worry that you might actually be hit by a train on the tracks. But still, there are also no railings and walking on the tracks you have to be very careful not to fall off. If you suffer from vertigo or an impaired sense of balance: don't do it! And if you do go for it, then take great care only to tread on the sleepers as the wooden boards in between them can be very brittle. I must say that found the experience actually quite captivating – but it sure isn't for everybody. Don't say you've not been warned. What is so remarkable about this viaduct, beyond its spectacular Western-movie-like looks and the sheer thrill of walking it, is the fact that it is one of only a few surviving wooden structures that were built by hand by those poor POWs back in 1943. OK, it has meanwhile been strengthened by concrete in places, but substantial parts of the original wooden structure are still in place. Try and spare a thought for the hard labour the construction of this little engineering wonder must have meant in those days. Back at the end of the viaduct at Tham Kra Sae station, there's also a cave that's of interest – not so much for the Buddha shrine inside (a pretty common sight in Thailand) but more so for the cavern beyond the first hall with the Buddhas – bats hang off its ceiling! If you skipped the balancing act on the viaduct and instead carried on to the terminus at Nam Tok, you could have a look at the waterfall there. Location: to the west and north of Thailand's capital Bangkok. 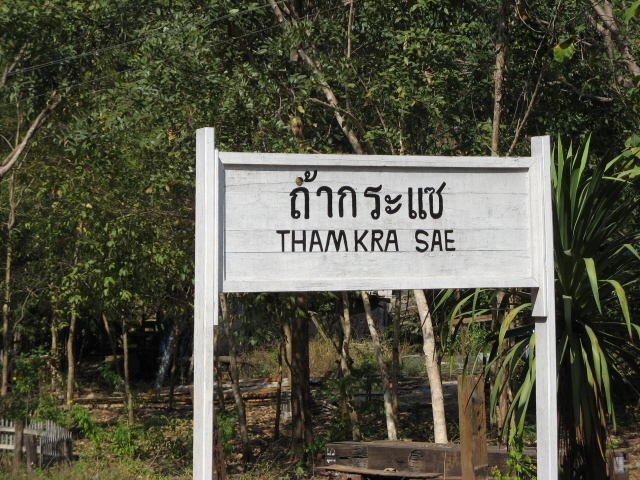 In fact, the initial stretch from Bangkok is not yet part of the original Death Railway – that starts from about 50 miles (80 km) along the line at Nong Pladuk. From there it goes west and then north for some 90 miles (140 km), first to Kanchanaburi and then on to Nam Tok where it currently terminates. Access and costs: fairly easy and cheap (just the ride – seeing the other sights requires more logistics and money). Details: if you just want to ride the railway, it's easy, you just turn up, buy your ticket and hop on. No reservations are required on regular trains, which are all third class, but still fairly comfortable. It only costs the equivalent of a few euros/dollars (a recent figure I found was 200 Baht return). Trains depart twice daily on weekdays from Bangkok's Thonburi station (now also called Bangkok Noi), one early in the morning (7:45 a.m.), one in the early afternoon (just before 2 p.m.). To make the return on the same day, you'd need the early train. At weekends, there are also all day return packages from central Bangkok, departing even earlier in the morning (6:30 a.m.) but returning the same day and stopping for short periods of time at Kanchanaburi and the terminus. It makes a lot more sense, however, to break the journey and take in the other sites, too, at least those at Kanchanaburi (for which the 60 minutes on the tourist day trips do not suffice! ), better still also Hellfire Pass, which requires a hired vehicle with driver. 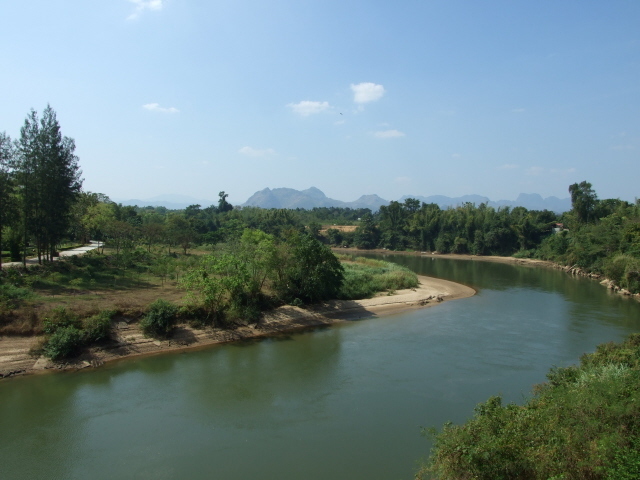 You can also skip the initial train journey (which isn't very scenic) and only take in the shorter stretch from Kanchanaburi to beyond Wang Pho viaduct and do the rest by car, with driver and guide. 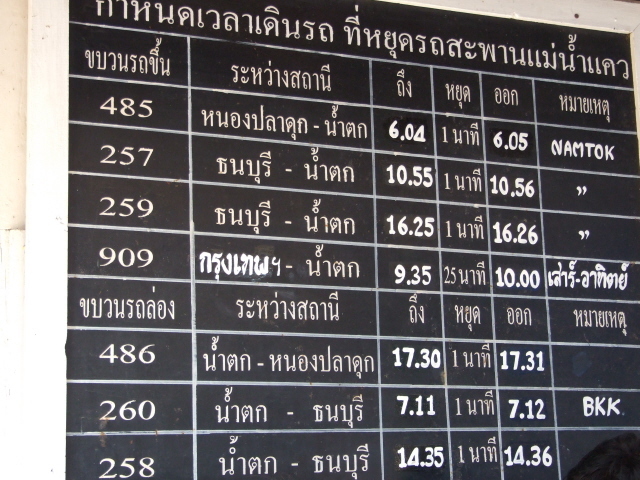 A whole day from Bangkok will cost in the region of 60-70 EUR per person, with lunch and guiding. It will obviously come to more if you want to stay over and have sufficient time for the excellent museums in Kanchanaburi and Hellfire Pass. 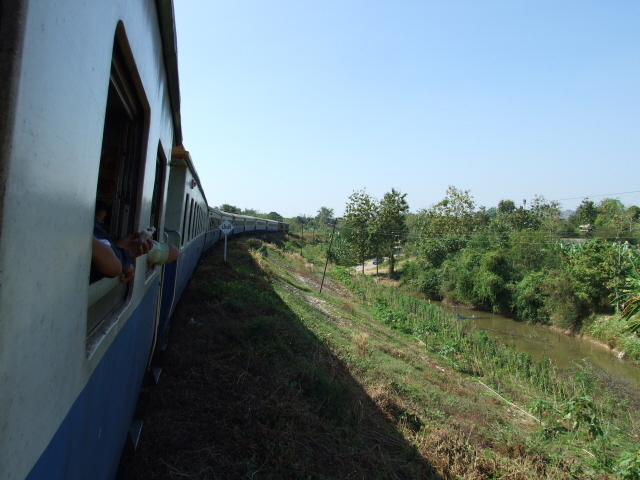 Time required: just riding the railway line to the end and back can be done in a day – a mostly boring day, as there are only a few really interesting spots on the line, namely at Kanchanaburi, and at points along the River Kwai, esp. Wang Pho viaduct. It makes more sense to invest more time and spend at least two days in total and take in some of the other sites at Kanchanaburi and Hellfire Pass. 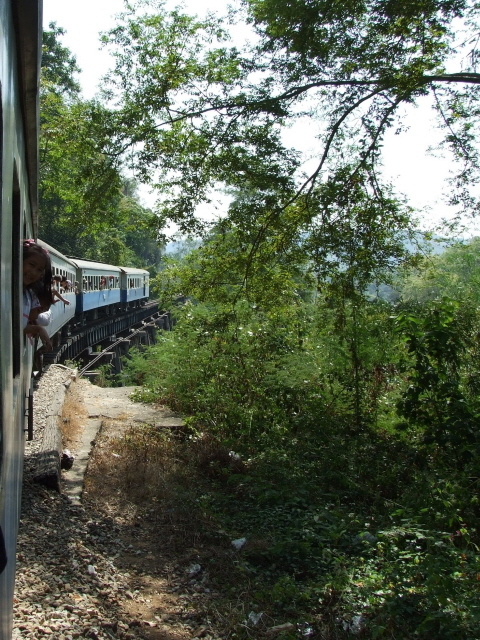 Combinations with other dark destinations: most obviously, the famous Bridge over the River Kwai at Kanchanaburi makes the perfect combination with a ride on the Death Railway – or rather, in fact, the other way round: Kanchanaburi can be easily combined with a short ride on the railway. 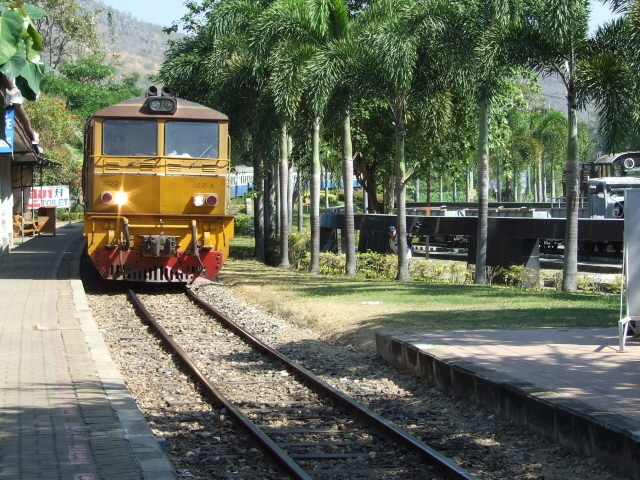 To get the most out of it, allow more time and take in all three railway-related museums and some of the war cemeteries in and around Kanchanaburi and ideally also Hellfire Pass. 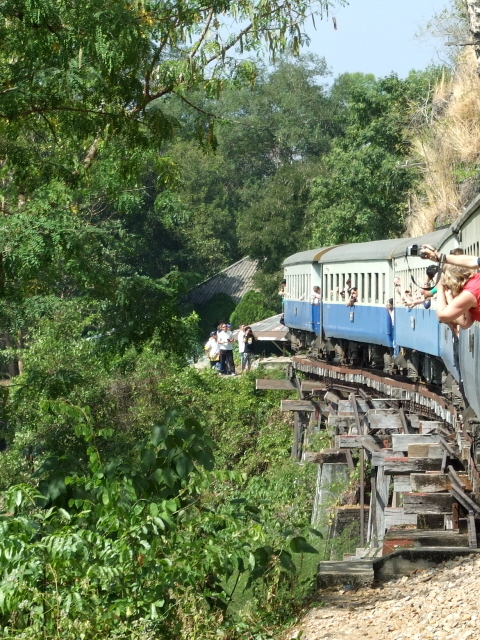 All in all, a two or three day package would allow you to "do" the Death Railway comprehensively. Other dark destinations that can easily be combined with this can be found in Bangkok. Combinations with non-dark destinations: allowing extra time and staying a few nights or so in Kanchanaburi and/or beyond (e.g. Hintok River Camp) would allow you to see some of the scenery and natural marvels of the area, which are well worth it – see under Hellfire Pass.